You know how your little brother Spronky covers his eyes and thinks that means you can’t see him? That’s what I’m doing today here on my blog. My paws are over my eyes. You can’t see me. I’m writing in my journal. There is a hot babysitter kneeling next to an ottoman. It is 1989. She has a Peter Gabriel tape in her purse. She is wearing a scarf. Birth control has been invented. 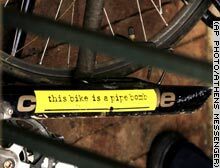 You know those stickers on bikes that say this bike is a pipe bomb? What is the deal with those stickers? I’m tired today. I saw Dept. of Eagles at the Cafe du Nord last night. Early show. They were terrific. This is the sentence about how I am too sleepy to write anything worth reading, unless you are writing an article about Monday, January 26, 2009, and what sleepy, overweight guys thought about on that day. I’m trying out Pandora today, because all my regular internet radio stations are acting unreliably. Television Personalities begat Field Mice begat Modern Lovers demos. I was sleepy yesterday, as well. I ate a passel of Chinese Food. Saddleshoos was wearing a vintage sequin jacket that had the same effect on me that a great poem can have. The swift, ornery fox crumples up his drawing of a lazy, bisexual dog.